Turtles have such long lives. They reputedly live up to 200years. 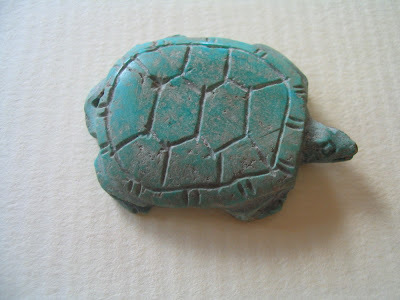 But still I daresay none can be as old as this turquoise turtle of mine which I bought several years ago in China. Most Chinese associate turtles with longevity, but if someone (especially the Hokkien clan) calls you Black Turtle Head, it is hardly a compliment. !! My, turtle measures 4cm. It looks like it is swimming, with the head slightly at an angle and 4 legs sticking out. 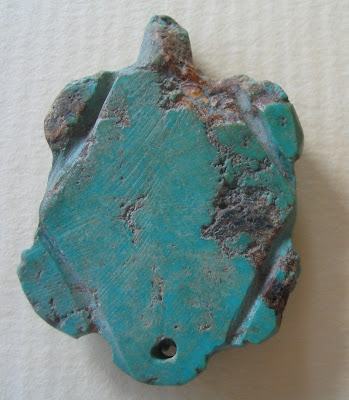 Its perforated at the tail and in the hole are concentric ring tool marks. There are also many marks on both the back and front of the stone. Are these tool marks or are the marks natural to the stone ? Are the marks ancient or modern ? Looks like I am posing more questions than describing my piece. !